Reliant Finishing Systems offers only brand name, professional grade powder application guns. We’re an award-winning sales outlet for Wagner manual guns, and we also work with Gema and Nordson. We’ve sold hundreds of powder coating guns, but we’ve never offered Asian knock-offs or unreliable hobby guns. There’s an influx of guns that look like those made by Gema, Nordson and Wagner, but they’re either built by small shops in the U.S. or imported from China and Korea. We avoid these and so should you! Invest in Quality. You’ll Be Glad You Did. There are several reasons to consider only professional quality, brand name powder coating guns from well known sales outlets like Reliant. The best reason is that the level of service and support that these established companies can provide eclipses the lackluster support that can be expected from their competitors. In addition to offering rock-solid warranties, all products built by the “Big Three” are supported by dedicated service teams. When you buy a brand name gun system, there’s a nationwide network of engineers and factory-trained distributors that can quickly provide you with a high level of support—often through local specialists. Don’t Let Your Powder Gun Hold Back Productivity. One problem that plagues hobbyist and look-alike guns is the lack of instantly available repair parts and the absence of any type of nationwide support network. Electrostatic coating guns require minimal maintenance, but there are a handful of wear parts that need attention from time to time. The major gun manufacturers have spent millions of dollars to assure that they have parts on hand for guns built years ago, not just those sold in the last few months. Also, there is a logical progression to their product development, so random substitutions of gun components from unproven vendors simply don’t happen. On the other hand, most of the low-cost guns are poorly supported newcomers to the U.S. market. A hobby gun sold over a period of months may have components that are sourced from numerous unknown suppliers, and the specs are subject to change without any real documentation. Imagine waiting weeks with an inoperable gun because nobody has the right replacement part in stock in the United States. Brand name powder application guns are engineered so that every component is designed for reliability, convenience, and consistent performance. Premium coating guns deliver increased transfer efficiency and provide superior results in the widest variety of coating situations. All of the most important coating parameters can be selected, changed and stored in programs within the guns’ controllers. A pro-grade powder application system allows you to get consistent results with less effort, less operator training time, and fewer things to go wrong. With the manual application guns offered by Reliant Finishing Systems, the premium features are all there, but the operation of the guns is simple and intuitive. Many shops that do contract work rely on box-fed manual coating guns. A box-fed gun pulls powder directly from the box that the powder was packaged in by the powder coatings supplier. The box is typically placed on the base of the cart that holds the gun controls. This allows for quick color changes and simple, intuitive operation. The powder is typically fluidized through vibration or air injection. One downside is that the powder media is exposed to the shop environment, so it is easier for the powder to become contaminated or otherwise degraded. A hopper-fed gun conveys the powder from a stainless steel hopper which can be removed from the cart to be refilled or cleaned. Fluidization of the powder is achieved by the use of an integral fluid bed. 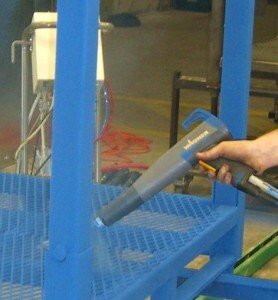 This coating system is ideal for manual coating in a production environment. We have both box and hopper-fed versions in stock at all times! For systems where powder reclamation is desired, we offer a variety of both manual and automatic powder capture, transfer and reconditioning equipment. Ask us about our rotary sieves and high-capacity hoppers. Reliant Finishing Systems also offers automated gun systems of all types. We often integrate automated gun arrays with our powder spray enclosures. We provide fixed multi-gun arrays, ram-type reciprocators, and oscillating gun mounts. Reliant has engineered and installed dozens of unique powder application systems for highly specialized applications. 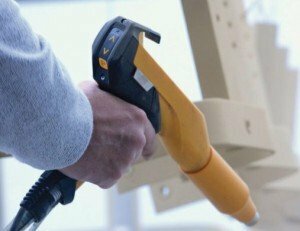 Whether you need a single box-fed manual gun or a completely automated powder application system, Reliant Finishing Systems will provide the powder coating equipment you need and gives you the highest level of training and support in the industry.